Invisalign is an orthodontic treatment used to properly align our teeth to achieve a healthier, more aesthetic smile! Invisalign can treat a variety of spacing and malocclusion issues that might be causing you physical pain, wearing down your teeth, causing gum recession, or just making you less confident about your smile. 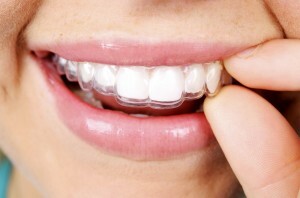 The Invisalign trays are clear, semi-flexible aligners that are placed over the teeth. Depending on your course of treatment, you will receive a custom number of trays for your treatment. The trays are to be worn about 22 hours a day, only to be removed for eating and brushing teeth. It is very important that you wear your trays as prescribed to ensure effective bone remodeling and tooth movement. The trays put pressure on your teeth at certain angles and locations. This pressure causes the bone cells to breakdown and make space in the direction that the tooth should be moved, and after moving for the bone cells to regenerate in the space they moved from. For the process to be effective, you must keep the appropriate pressure on the teeth for the entire duration of the treatment. After completing a series of trays custom-designed and prepared for you, you will have achieved proper alignment and spacing. At your initial consultation, Dr. Jorgenson will perform a comprehensive exam and take a few smile assessment photos to determine if you are a good candidate for Invisalign treatment. Dr. J will put photos of your alignment and bite up on a monitor so he can discuss any current malocclusion or alignment issues you might be experiencing. He will discuss the Invisalign process and answer any questions to ensure you are ready to move forward with treatment. To begin the Invisalign process, we will take impressions of your teeth using an impression material, that is more like a playdough consistency than anything goopy, to send to the Invisalign lab. This will allow the Invisalign lab to make a 3D model of your mouth. The orthodontists at the Invisalign lab will then determine which teeth need to be moved where and how they can achieve this using a series of trays to move your teeth into the proper alignment. Once this is complete, Dr. Jorgenson will receive a digital video of the planned treatment model called a ClinCheck. We can go over the ClinCheck with you in our office to explain how many trays and how long you will be in treatment or Dr. Jorgenson can approve or make changes on your behalf! Once the ClinCheck has been approved and the course of treatment has been determined, the Invisalign lab will get started in making your series of custom trays. The trays are delivered to our office within 1-2 weeks. At that time, you will come in to start your first set of trays. We usually provide you with 2-3 sets of trays at a time so you can progress through the series at home, only coming in every 4-6 weeks for a checkup. During your checkup visits, Dr. Jorgenson will perform a quick exam to make sure the treatment is progressing as expected and provide you with your next sets of trays. In no time at all, you will be finished and get to see the amazing results you achieved with the Invisalign process! Invisalign trays are very easy to take care of! The beauty is they can be removed while eating to prevent food from getting stuck in them and can be gently brushed and cleansed. We recommend that anytime you take out your Invisalign trays to eat, you rinse them under cold water or gently brush them before putting them back in. If any set of trays becomes discolored or develops a smell from dried bacteria, you can also use an effervescent cleaning tab to soak and brush them for an extra clean! One special note of caring for your Invisalign trays, is to store them in a safe place such as a case or the tray bag when you are not wearing them! It is very easy to accidentally throw them away when you place them in a napkin or another place where they are not easily seen. Call 714-424-9099 to schedule your free consultation with Dr. Jorgenson today! Our office is conveniently located in Orange County near the 405, 55, and 73 freeways. We’d also be happy to check any insurance benefits you might have to assist you with the cost of treatment. If you don’t have coverage, no problem! We also offer a wide-variety of payment options that could get you down to as little as $112/month! Our friendly and knowledgable Costa Mesa dental staff is standing by 24/7. You can reach us by phone/text at 714-424-9099, by email at info@mycostamesadentist.com, or book your appointment/live chat us on our website at www.mycostamesadentist.com!